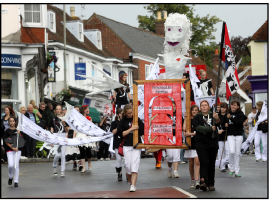 Uckfield Carnival originated 185 years ago and was organised by shopkeepers on Wednesday afternoon, early closing day, latterly moving to the first Saturday every September. 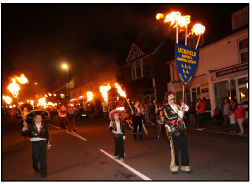 The Society spends most of the year fundraising and several months preparing and making 3,500 torches for the torch light procession, which is supported by other Bonfire and Carnival Societies of Sussex, bands, majorettes, and decorated tableaux. The Society's motto is "We burn for charity" and each year the Society donates thousands of pounds to local charities and deserving causes. 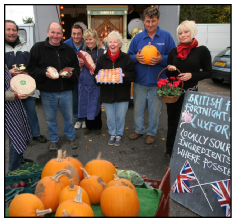 Uckfield Farmers Market operates on the first Saturday of each month in the lower end of Luxfords car park. The market operates from 9am and continues through until 1pm. The market is very popular with both the local community, and out of town visitors. It is also a major supporter of the town's surrounding agricultural community. There is a regular attendance of stalls offering a very wide range of fresh, locally grown or prepared products, including meats, cheeses, preserves, bakery and pies, plus plants and flowers , so there is something for everyone. The market was considered by the BBC Good Food Guide as the most successful farmers market in Sussex, and won the prestigious Sussex Food and Drinks Awards 2008 and 2010 as the "Best Farmers Market in Sussex"
Due to the market's rule that all products are supplied from local resources the customers' carbon footprint is reduced, as the average mileage from farm to table is just 8 miles. Samples are regularly offered to taste prior to purchase. The Farmers Market can be contacted on 07553 798108 or via their Facebook page. Is an active association with over 100 members of all ages. They have strong links with twin towns in Germany and France as well as a strong programme of youth activities and regular social events. Uckfield has been twinned with Quickborn in Germany since 1989 and local residents have regularly been welcomed in this northern Germany town for the annual Eulenfest celebration, while they host German visitors to the Uckfield Festival. 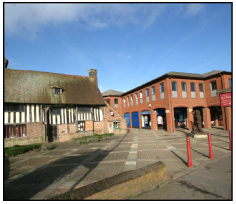 2011 saw the formal twinning with the new French partner town of Arques-la- Bastaille near Dieppe. In the last few years primary school groups have stayed with families in France, teenagers have taken part in exchange youth camps, while adults on both sides of the Channel have made friends and enjoyed hospitality. The Association also supports local teenagers to attend an annual International Youth Camp which takes place in countries throughout Europe. In 2010 an organised camp in Uckfield attracted young people and youth leaders from England, Germany, France, Sweden, Latvia and Finland. Apart from the formal twinning activities they run a series of social events, quizzes and talks throughout the year. Uckfield Leisure Centre in Downsview Crescent offers the best leisure facilities for the town. There is a 25m pool which has a gently sloping beach and a flume: perfect for families and those who want to swim for fitness. There is a fully equipped gym, a wide range of exercise classes, squash, badminton, table tennis, sauna, steam room and a cafe. If you want some time to yourself to exercise, book your children into the creche - open five mornings a week. Kids' holiday activity clubs, birthday parties and swimming lessons are also available. News is gathered and written by experienced journalists for the www.uckfieldnews.com website which is updated every working day. A list of Uckfield Stories of the Week can be seen each Saturday. Diary Dates give people an idea of events coming up in and around the town and Personal Shopper and Business Scene features keep visitors informed with shopping tips and business news on the first of every month. The Uckfield Directory carries details of Uckfield businesses and organisations and links to their own websites. Where companies offer more detailed information they are promoted in a Special Features section. There is a scope for display adverts on the site too. Visitors are invited to join in conversations about Uckfield on the Uckfield News Facebook and Twitter Pages. 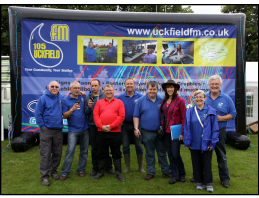 If you would like to know more about Uckfield News please call Cathy Watson on 01825 760102 or email her at cathy@uckfieldnews.com The Uckfieldnews.com websites is produced in Uckfield, by Uckfield people for Uckfield people. 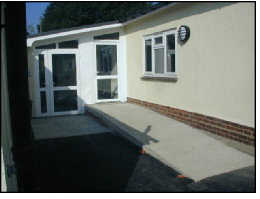 The Volunteer Centre acts as the focus in the community for those wanting to do voluntary work, and also for those needing help of some kind that volunteers could provide. Much information about voluntary groups and local services is held, as well as information about the local area, including bus timetables, etc. Contact details: 79 High Street, Uckfield. Tel: 01825 760019 Email: uvic@btconnect.com web: www.uckfieldvolunteercentre.co.uk Open: Monday, Wednesday, Friday 10am - 1pm, Tuesday and Thursday 10am - 4pm. The CAB is located at The Hub, Civic Approach. Volunteer staff provide free, confidential, impartial and independent advice on a range of subjects including employment, consumer and welfare benefits rights plus relationship or debt problems to name a few. If they can't deal with it, they know someone who can! They are open Monday, Wednesday, Thursday and Friday (closed Tuesdays) from 9.30 to 3pm or telephone on 01825 764940 during the same hours. Or just drop in!